I’m indebted to David Robertson and the EC Forum for the news that we can add Nigel Davies to the list of what I have come to call Verghese bullshitters. 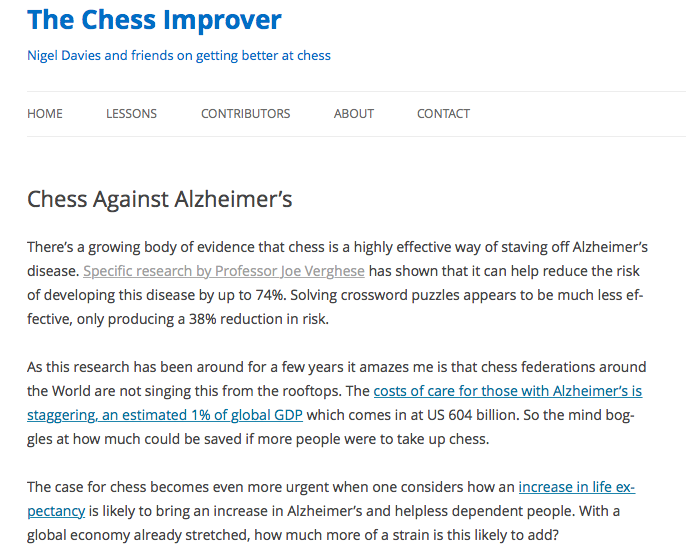 "There is a growing body of evidence that chess is a highly effective way of staving off Alzheimer’s disease", Davies - chess Grandmaster - writes in a blog post published a few years back. "As this research has been around for years", the renowned authority on health matters continues, "it amazes me is that (sic) chess federations around the World are not singing this from the rooftops." Well, let us pass up the opportunity to comment on Davies’ gauche reduction of the impact of dementia to its financial cost. Let us not dwell on his tasteless - not to mention inaccurate - depiction of those living with dementia as "helpless dependent people". Let us merely address the issue that Doc Nigel raises. Why is it that Verghese’s study - "specific research", according to Davies - is not being promoted by the world’s chess federations as the answer to dementia? Might it be because the article, which can be found online by anybody who cares enough about the subject to read it, doesn’t actually mention chess? Susan Polar/Michael Gelb, Ray Keene and now Nigel Davies. Chess celebrity in action. Doesn’t it make you proud to be a chesser? I am informed that "Jonathan B" is an official of ECF. Here in the United States, the British have the reputation of a being a well-mannered people, especially their representatives of public bodies. Jonathan B's gratuitous, scatological attack on a years-old blog posting by one of your nation's more respected chess professionals, a posting intended to recommend chess as a form of mental activity of the sort encouraged by many neurologists, disproves the stereotype and shames JB's office.
" ... and shames JB’s office." It would if I had an office. You are entirely incorrect Mr D. I am not an official of the ECF. I would sack your informant if I were you. Gratuitous was J.D. calling your post scatological. @RdC: not an unreasonable question per se but I think I’ll skip it for now. Wouldn’t want the focus to leave the subject at hand.